It's one thing to make a bigger display. It's something else entirely to make a bigger multitouch display with brilliant colors and higher contrast at even wider viewing angles. But that's exactly about the Retina HD display. Built on 64-bit desktop-class architecture, the A8 chip delivers more power, even while driving a larger display. The M8 motion coprocessor efficiently gathers data from advanced sensors and a barometer. And with increased battery life, iPhone 6 lets you do more, for longer than ever. More people take more photos with iPhone than with any other camera. And now the iSight camera has a sensor with Focus Pixels and amazing video features, like 1080p HD at 60 fps, slo-mo at 240 fps, and time-lapse video mode. So you'll have more reasons to capture more moments on video, too. iPhone 6 has faster LTE download speeds, and it supports more LTE bands than any other smartphone so you can roam in more places. And when connected to Wi-Fi, you'll get up to 3x faster speeds. I actually own an iPhone 6 and an iPhone 6 Plus. My son won't part with his 5. 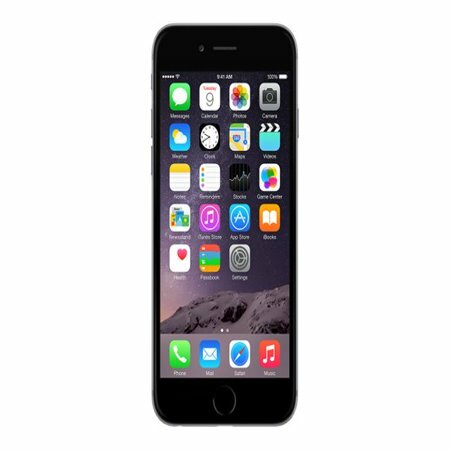 We love the 6, the 6 Plus was a BIG mistake. Way too big for my small hands and I wish I would of gone with the smaller phone. I've had an iPhone since the first one came out. I could never switch to any other phone at this point. The iPhone convinced me that a MAC has to be a great PC and I now LOVE MY MAC. I just purchased the iPad mini 3 and I have an iPad air both 128 gb. I thought I would sell my air and keep the mini, but I'm having a really hard time parting with it. Every time I upgrade, I sell my old iPhone unlocked and it almost pays for the new phone. It's amazing how much people will pay for used Apple products. They are the best. iPhone. 6 64GB space gray. Had some misgivings about upgrading bcuz of all heard about this phn ( ie: bends in ur pocket) but I'm really pleased. The sound, picture, speed, etc. all the bells n whistles are there. veri nice support and nice item good job! Very Very good quality and nice support thanks a lot ! First off, this is a refurbished phone even though it doesn't plainly say it. It does not come with earbuds, either. My daughter loves the phone but we immediately had to replace the battery since it would run down in 30 minutes from a full charge. We're happy with the phone, I took stars off because they didn't advertise this plainly as a refurbished phone (even on the questions section, when asked if it was new or refurbished, the answer was "new"). I felt this listing was intentionally misleading.